Happy Birthday to all Centaurs with your Sun between 0 – 9.59° Sagittarius. Your birthday falls between November 21-December 1, depending on the year you were born. Being born in the first decan (the first ten degrees) of Sagittarius, your Sun is in the Sagittarius decan, giving Jupiter sole rulership of your zone of the zodiac. This is the purest expression of Sagittarius energy. If your Sun is aspected by Jupiter or placed in the 9th house, the Sagittarius qualities will be naturally strengthened. You’re the Centaur that takes the first step into a new world. Fueled by optimism and an undying belief that something magnificent waits just up the road, you can’t wait to get there. What an adventure! There are a couple of ways I associate astrological symbolism with the tarot. One is by assigning decans to each of the numbered pip cards from 1-9. 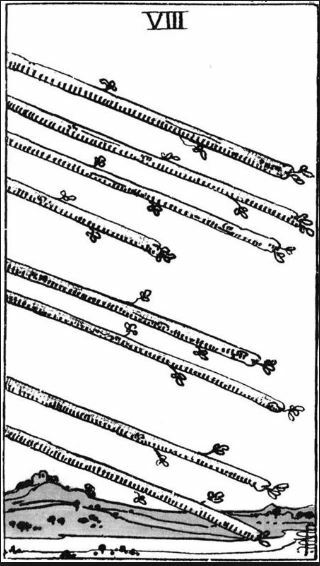 Another is by the system of using planets in signs for each of the minor arcana cards. Numerology is also a way to connect to the tarot. 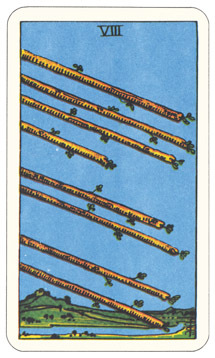 The tarot card for the first decan of Sagittarius is the 8 of Wands, associated with Mercury in Sagittarius. Here’s an excerpt from Year~Seer: The Nine Year Cycle of Life, Cycle 8, my book on numerology and the tarot, about the 8 of Wands. The “Cycle of 8” refers to the #8 year in numerology, but the text is suitable for the card at any time. Has taking quick, powerful action had a positive effect on your life? “Speak softly and carry a big stick.” That’s a good one, huh? But how do you know when to strike and at whom? The fiery side of the Cycle of 8 is quick, decisive, assertive and exacting. If you linger, you miss the opportunity to strike while the iron is hot. If you impulsively strike from a gut reaction without thinking, though, you could needlessly harm yourself or others. How have you responded to stimuli in the past? When you acted aggressively and impulsively, did it move you closer to your goal? What snaps your buttons or pulls your strings? Has it hindered you or helped you in the past? In the Cycle of 8, you may also receive hot tips and bits of juicy information. These can come through conversations with people in the know, discovering secret or elusive data regarding a project, or just a bolt from the blue. These pieces of information can complete the puzzle and enable you to make a major move forward. Then what? How do you utilize this new knowledge? You could start by asking yourself how such information affects your actions. Is flattery something to which you are susceptible? Do you lose sight of your goal by falling prey to flattery, compromising yourself for ego gratification? Is dirty gossip a part of the information? Would you knowingly use this news to harm someone to advance yourself? Is there any real truth to the news at all? Research the facts and detect the accuracy of such news. You learned how to do that during the Cycle of 7. If you find it advantageous to do so, use the information and take the necessary action to gain ground. Be above board and forthright in making an assertive move. The moves we make toward our goals are always a little risky. But we stand to gain so much when right timing allows us to reach for and grab the otherwise unattainable. Strive for opportunity to grow, not only in prestige or materially, but also in heart and spirit. What incoming information is important at this time? How is my aim in reaching my goals? Am I going too fast to process the information? New Moon in Sagittarius ~ Ethics or Ego?